De La Rue is predicting buoyant growth for its product authentication and traceability (PAT) unit thanks to growing demand in sectors such as pharma and tobacco. 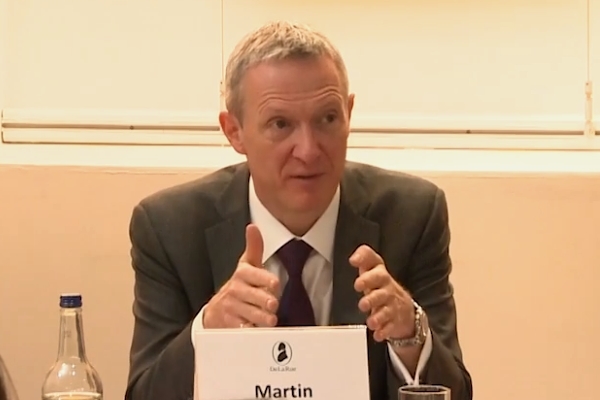 Chief executive Martin Sutherland said during the company’s interim results briefing that he expects the division – which focuses on government contracts to supply tax tamps as well as commercial business in brand protection – to double in size within the next three years. “Momentum is building, and we have had new, significant contract wins in the first half of the year,” including two new pharmaceutical clients, he added. There is also strong demand from the vaping industry, with several suppliers interested in guarding against the sale of counterfeit goods, particularly to children. There is also growing demand for tax stamps driven by the Tobacco Product Directive (TPD) in Europe as well as the World Health Organization Framework Convention on Tobacco Control (FCTC), which both came into force in recent months, resulting in what Sutherland described as two “very significant” contracts in the last few months. The company has been investing to build its PAT business, closing a $25m acquisition of DuPont Authentication last year to bolster its position in photopolymer holographic films and 3D holograms, and says it is also considering other ‘bolt-on’ acquisitions to extend its product range further if the right opportunities present themselves. Overall, group revenues (excluding a divested paper business) grew 9 per cent to £242m ($309m), with PAT revenues increasing 2 per cent to £19.4m on a pro forma basis, and security features – which are relevant across all the company’s business – rose 16% driven by new customer wins, increased volumes from existing clients and new launches for banknotes, passport laminates and its Blulock holographic product for the brand protection market. Since then, De La Rue has launched two more security features – both aimed at the identity market - namely an ultraviolet ink called PhotocolourUV and MyImage, a personalisable polycarbonate feature developed jointly by De La Rue and new partner Opalux. Sutherland also announced a shift in the focus of its identity solutions division after losing out to rival Gemalto in the tender for the new UK passport earlier this year. That would allow De La Rue to address the state market, i.e. countries that are printing their own passports and identity cards, which have hitherto been outside the company’s scope but account for three quarters of the overall market worldwide. There is also a near-term opportunity for De La Rue if there is a no-deal Brexit, as there may be a need for an interim passport design. De La Rue is in discussions with the UK on this as part of the government’s contingency planning. De La Rue also provided some useful estimates of the size of the brand protection market during its interim results call, saying that tamper-evident features representing around 34 per cent of the total, product traceability features making up 37 per cent and product authentication at 26 per cent. The remaining 3 per cent slice was anti-theft features. Within traceability, government revenue protection represents a £320m annual market, while serialization and product coding is worth another £3.1bn and enterprise track-and-trace comes in at around £772m. Meanwhile, in the product authentication category, the security hologram market is worth £338m and brand enhancement foils are valued at £971m, with intellectual property and brand protection services accounting for an estimated £157m. Another £931m chunk of the market is represented by the wide and highly varied array of other security devices deployed for product authentication.